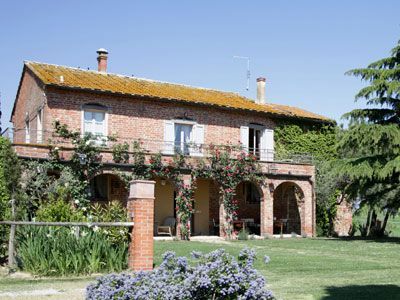 Casa Bellavista is nestled on a hilltop in the Val di Chiana, amid the lush fields of grain, sunflowers, olive groves and vineyards and encourages your heart to dream of all things Tuscan. At Casa Bellavista, you will experience the relaxed rhythm of Tuscan country life while you enjoy the panoramic views of the Abbazia di Farneta, Montepulciano, Lucignano and Cortona, the hill town of “Under The Tuscan Sun”. Centrally located between Rome and Florence, just off the A1 route, Casa Bellavista provides an ideal location for daytrips to the Tuscan hill towns and cities of Arezzo, Siena, Sansepolcro, Pienza, San Quirico, Montepulciano, San Gimignano and Cortona, as well a Chianti Country. Casa Bellavista is also a convenient location for daytrips to the Umbrian villages of Assisi and Spello as well as a drive around the majestic Lago Trasimeno. Casa Bellavista is an ideal place for those visiting central Italy. So come, relax with a glass of fine wine, admire the rolling Tuscan hills and enjoy a Tuscan sunset. Golf club, sporting fishing 10 km, horseback riding 15 km, restaurants, supermarket, shops.